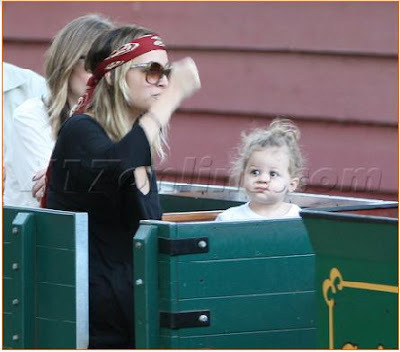 Nicole Richie and daughter Harlow Madden spent the afternoon at the Griffith park train museum in Los Angeles. According to the paparazzi Nicole was wearing a wedding band on her finger. - I would be really suprised but Joel did recently tweet through Twitter that he and Nicole are not married. The Richie-Madden girls look like they had a great time at the train museum! Nicole Richie was looking as fabulous as ever wearing her favourite Jet by John Eshaya thrashed jeans, a slouched V neck sweater, black havaianas, dior sunglasses and a fabulous red and cream Alexander McQueen scarf. saw other pics and yes you can see a wedding band or ring. that said it could be just a ring she put on or a promise ring so let's see. i love seeing pictures of nicole to watch her style!, but its sad to me when you can tell harlow notices those photographers and can't have any fun. i wonder if the ring is really a "wedding" ring or maybe engagement, or just a ring! Harlow is wearing her favorite tee shirt by SWEET DREAM TEES!! It is the "Love Bug" tee.